Thanks to the German Capuchin missionaries in Saipan, we have this one, old (1900s) Chamorro song about New Years. 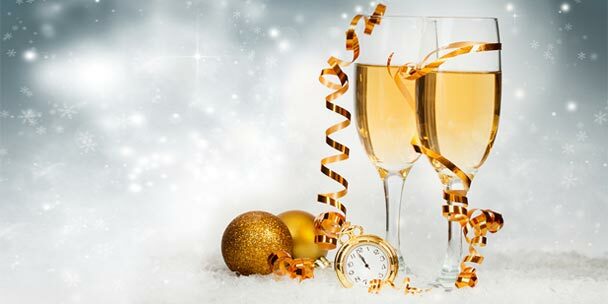 New Years was not as big a celebration in olden Spain, and her colonies, as the world celebrates it today. But the German culture did celebrate it with a bit more attention and so it passed from the German missionaries to their flock in Saipan and Luta in the early 1900s. In the song, we thank God for the graces of the past year and we ask for continued grace and protection in the coming year. We also ask eternal rest on those who died in the past and on those who may die in the time ahead. This song, sung repeatedly in the Northern Marianas for New Year's, lead to the modern custom of lighting candles for each person who died in the year just passed. i muna' fan huyong hit. na såkkan ni para hita. u ma arekla i ha'ani-ta. ya an guaha sea kåso måtai na såkkan. 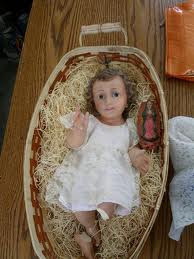 A Christmas song from Saipan, where the Niño is always dressed in cloth, as in the picture above. Maigo', maigo' Påtgon Långet maigo'. Maigo' maigo' Påtgon Långet maigo'. 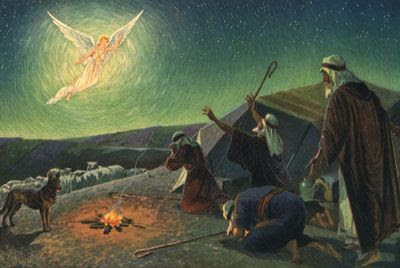 In this Christmas carol from Saipan, the angel directs the shepherds to see the Christ Child in Bethlehem, and the shepherds respond in the refrain "We are all ready!" This carol is only now becoming known on Guam, since it was only taught to the Chamorros of Saipan and then of Luta by the German Capuchin missionaries there in the early 1900s. Guam had the Spanish Capuchin missionaries at the time, teaching them different Christmas carols. para i Belen guato ya en li'e' i milågro i Mesias ni måtto. i Verbo Divino na sen bula pinepble i sen såntos na Niño. Todos ham man listo ya tåya' u ma dingo para in adora i Niño. en sedda' siempre i Niño nai matå-ña gåtbo mås ke diamånten fino. en li'e' i nanå-ña ya i gaige gi langet ayo proprio Tatå-ña. na ma'lak ininå-ña para giå-ta guato gi sen popblen sagå-ña. na hokkok mina'lak-ña i Niño mafañågo pot nina'siñå-ña. 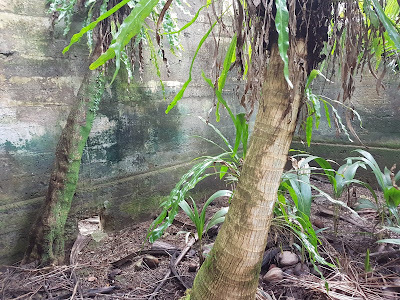 Much of Guam's history is hidden right in front of our eyes. We pass these sites all the time and are not aware of the history, or that they even exist. Just turn a corner we normally ignore; venture just a few steps more, and we're facing a piece of island history. Take for example the Japanese rice mill in Malesso'. It's not terribly difficult to see, but it is off the main road. It sits on private land, so one has to ask permission of at least the neighbor through whose land one must pass. The barking dogs will make you do that, anyway. When the Japanese occupied Guam, from December 1941 till July 1944, both the Chamorros and the Japanese turned to the land and sea for food. Some food continued to be imported from off-island, but in ever-decreasing amounts due to shortages and the dangers of American attacks. In 1943, the Japanese government made self-reliance in food the absolute rule on Guam. Even more so for the Japanese than for the Chamorros, who were quite happy with corn and other carbohydrates, rice production was a top priority. Paddies were started typically in the southern half of the island where low-lying, watery areas, often crossed by rivers and streams, made rice growing ideal. In December of 1943, a rice mill was built by the Japanese in Malesso'. It consisted of two, non-adjoining rooms. Rice paddies may have surrounded the area, which is low-lying, not far from the beach. Though no documentation exists, that we know of, to prove it was a rice mill, this is what some local residents alive during the Occupation say it was. The mill was not in use for long, though, if at all. 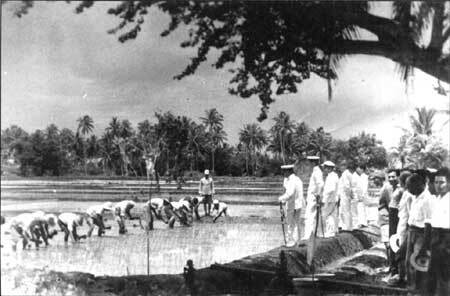 First of all, rice production was more or less a failure on Guam during the Japanese Occupation, for several reasons. Harvests were poor and could not adequately feed the Japanese military on Guam, especially when their numbers increased in 1944 in anticipation of the American invasion. By March of 1944 or so, just four months after the mill was built, preparation for all-out battle with the Americans took precedence and farming took a back seat, especially when the Japanese rounded up the Chamorros to wait out the battle in the interior hills and jungles. Today, the roof and interior floor of the mill are gone. Inside the building, vegetative and man-made debris litter the area. All around the mill, the same conditions exist. 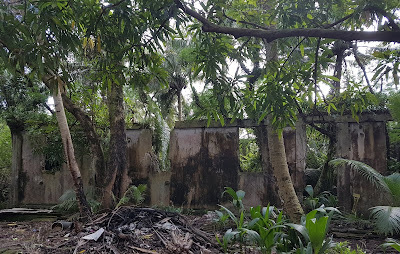 Yet, despite typhoons and earthquakes, the four concrete walls of the mill are still standing, more than 70 years later. 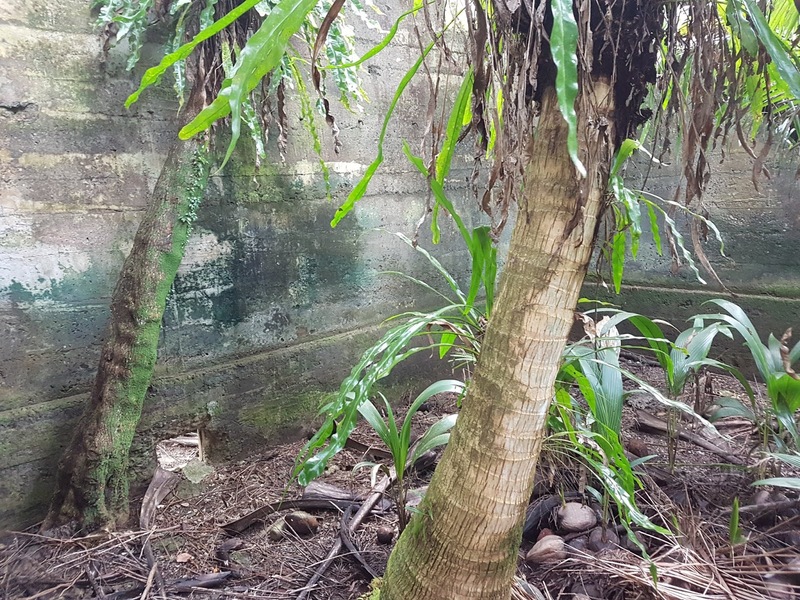 It is the only non-military Japanese-built structure surviving on Guam from the Occupation. This Chamorro version of the famous carol "Silent Night" is sung by Donovan Afaisen and Andrea Pangelinan. It begins with the English version and then the Chamorro version follows. u ma tuna si Yu'us! gigigo ha' yan si Jesus. 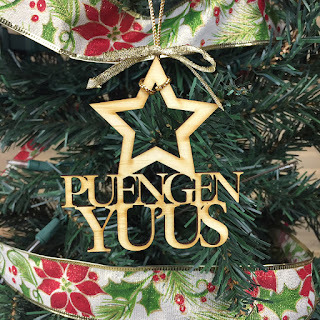 ya ti yan-ñiha si Jesus. Echongña. This word is now forgotten by most. Even many older people (aged 80 years and up) do not know that it means "side." The word appears in other hymns, too, like in "O Maria Nana'magof" where it says, "tunanas gi echongñå-mo," meaning "straight alongside of you." To modern-day Chamorros unaware of this word, it sounds like "echong ñåmo" or "crooked mosquito." There are slightly different versions of the wording of this carol. Påle' Roman de Vera, Capuchin, was the first to publish a Chamorro version on Guam. 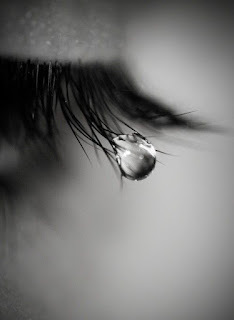 Some people hardly ever cry at all, even when they are profoundly sad or moved. They have the ability to fight back the tears and keep their eyes dry. Others can cry in an instant, for the simplest of reasons. It doesn't take them much to shed a tear. It's as if the tear was already on hand, just waiting for the slightest reason to come out. These people are said to be nátata lago'-ña. Their tears are shallow. Why? Their tears are right at the surface of their eyes. Any closer to the surface and their eyes would be spilling out tears all day long. In order for these people to cry, they don't need to reach into the deep recesses of their storage of tears. Their tears are right there, on the surface, shallow, ready to shed at any moment. As the above headline states, Christmas didn't happen on time on Guam one year, in 1910. Well, that's according to the American Navy which ruled Guam in those days. The Chamorros and their Chamorro and Spanish priests, however, celebrated Christmas on time just the same anyway. As far as the Americans were concerned, however, it was the United States that brought Christmas to Guam. The article from the same newspaper above stated, "Christmas on Guam is only twelve years old," brought to Guam only in 1898 when the United States took control over the island away from Spain. 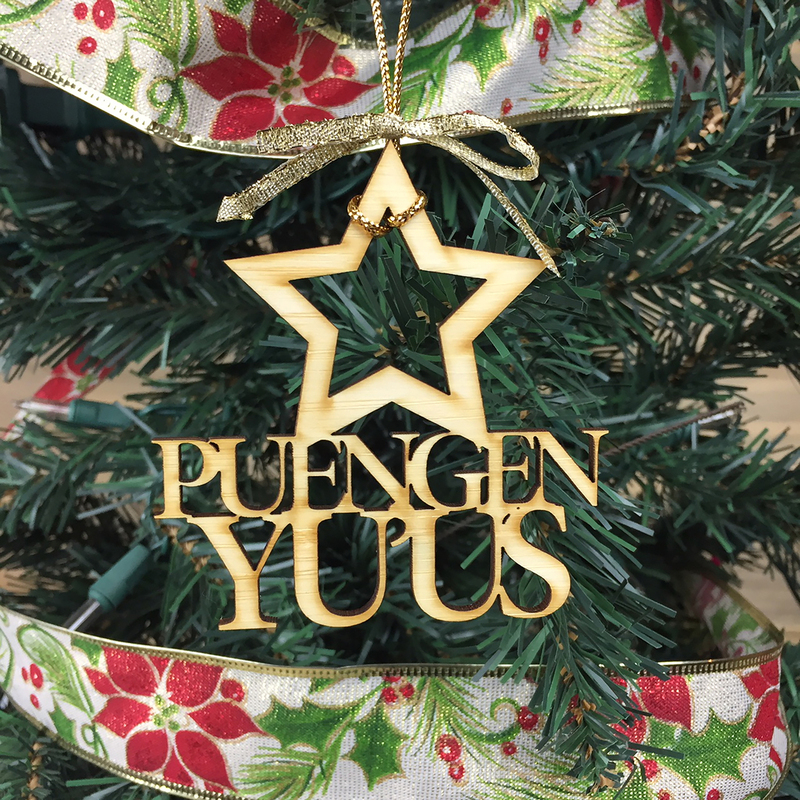 Never mind that the Spaniard Sanvitores came to Guam in 1668 and celebrated the first Christmas here that same year, two hundred and thirty years before the Americans came. According to the Americans, Christmas couldn't happen on Guam either unless the American Santa Claus brought gifts and toys to the island. That's why Christmas was late in 1910. Starting in 1907, the American Navy brought hundreds of Christmas toys and candy to Guam for the school children every year. But in December of 1910, the health officer on Guam would not allow the Navy ship to unload passengers or cargo because one man on board had a mild case of smallpox and was actually already recovering from it. Still, no amount of convincing could change the health officer's mind. The ship had to continue to Manila without leaving behind all those toys and candies for Guam's school children. And that is why, the American newspaper said, Christmas didn't happen on time on Guam that year. Better tell that to the thousands of Chamorros who were at midnight Mass for Christmas. Apparently they had no idea that Christmas couldn't happen until the toys came. Christmas on Guam only started in 1898, according to this American newspaper! This saying sounds strange at first to people hearing it for the first time, but it was heard by some older people in the past. Here's the idea behind it. A hen usually lays her eggs in a coop (kasiyas) or basket (ålan månnok). 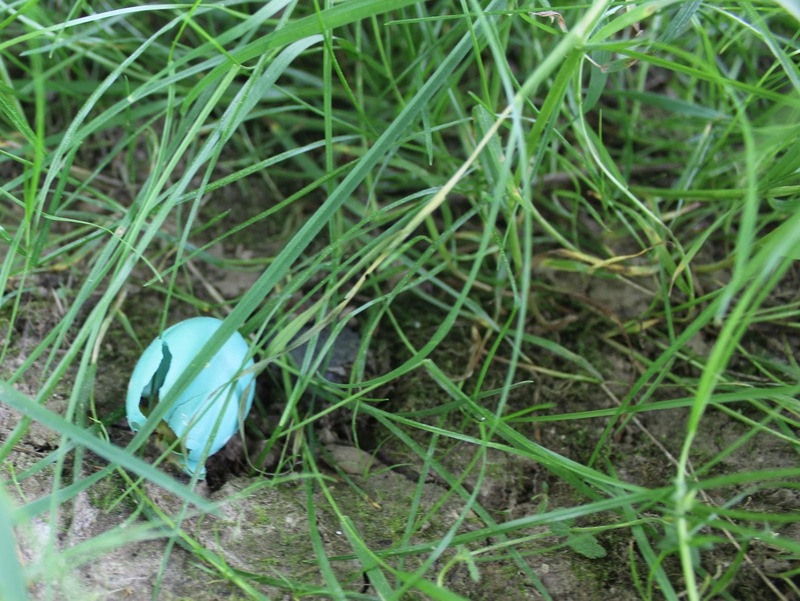 So if a woman gives birth to a child out of wedlock, it's like the hen who lays her egg out on the grass, in a field and so on. Far away from the public eye, from the usual places a hen would lay an egg. Even the child would be called påtgon sanhiyong, a child "from the outside, " outside of marriage, that is. There were lots of births out of wedlock in the old days. But it was considered something shameful. There would be no christening party, for example, when the baby was baptized. In 1742, the British admiral Lord George Anson stopped at Tinian and saw a sakman (flying proa) sailing on the sea. He was impressed with its speed, reckoned by many today at 20 knots or 23 miles per hour on land. Anson needed to make repairs and replenish food and water supplies at Tinian, and give his crew some rest and the sick among them some convalescence, but he couldn't stay long since the Spaniards in Guam might send up an armed force if they heard about this British visit. So Anson destroyed the boat and the sakman being used by the Spanish and Chamorro men drying beef in Tinian before he left the island. But he also had his draftsman draw, in great detail, the design of the sakman. 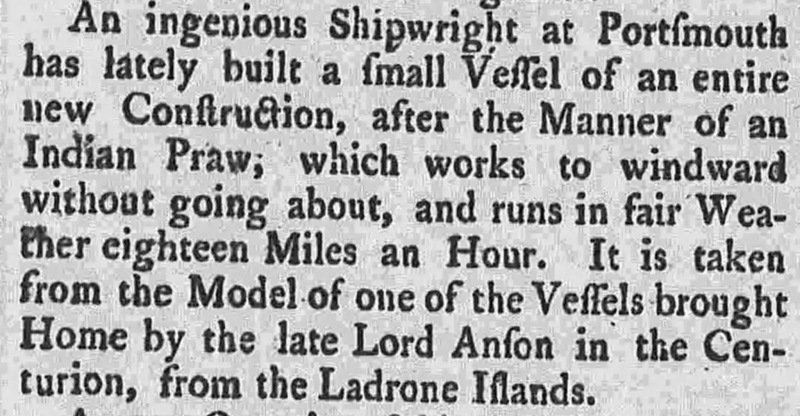 This drawing made its rounds back in England, along with the story of Anson's travels in book form, published in 1748. Well, twenty-some years after news of Anson's voyage in the Pacific, his visit to Tinian and his depiction of the sakman circulated around England, a British shipbuilder decided to make a canoe based on the Chamorro sakman as documented by Lord Anson. 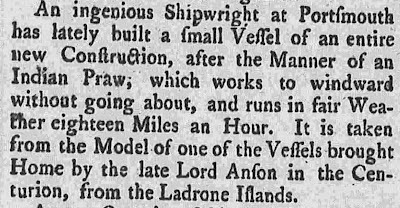 The story appeared in a British newspaper in 1767. Notice that the article talks about a praw (proa) and that it belongs to the Indians, a common name in those centuries for natives of America and the Pacific. The Spaniards called Chamorros and Filipinos indios in those days, too. The Marianas were still called Ladrones by many in those days, as well. The British copy of the Chamorro sakman could not have been an exact replica. Local, English materials were undoubtedly used, rather than Pacific island material. I wouldn't be surprised if there were technological changes made, too. But it goes to show that European admiration for the Chamorro sakman's speed and agility was strong enough for one English man to make a functional replica of it 250 years ago. What became of it remains an unanswered question.